The frantic spring push is finally over. I am sure some other farms are different, maybe other farmers or ‘specialist grower’ as we prefer here like hot steamy weather, maybe they like being outside in heat and humidity. Well I don’t, neither do our people. So we try our upmost to get as much as possible done before it gets hot and more especially humid. Its horrid working outside when the air feels like the inside of a sauna. I push and cajole everyone along to get all the field prep done before the heat hits. Most years we make it, this year we did not. Well not exactly. This year we have been lucky its not been humid yet. Most years by this time in June its humid as all heck but not this year, not yet. So we were able to get most of the stuff finished. It makes spring an extremely busy time. 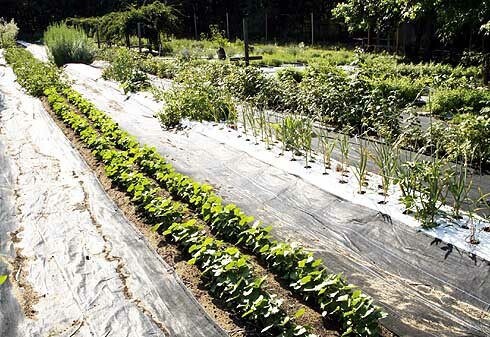 First the rows have to have their yearly compost additions, then the irrigation tape must be laid and then overlaid with the plastic mulch and the lumite put back down in the ‘aisles’ to keep down the weeds and contain any soil borne diseases (mostly molds). We don’t spray anything not even with organically accepted chemicals so prevention is extremely important. It’s a mad rush to get it all the fields prepared. At the same time we are looking after our little seedlings, watering them in their trays and then transplanting them into larger individual pots to grow on large enough to be planted in the fields. Then of course when they are big enough planting them out in the newly prepared fields. If that is not enough on a medicinal herb farm harvesting of perennials starts early, usually long before the field preparation is completed and always before all but a very few new plants have been transferred to the fields. Some plants crop very early Greater celandine is one of the first but its soon followed by nettles, motherwort, cleavers and honeysuckle. All these need to be harvested checked over and dried ready for sale or use in many of our products. Its also the busiest time for our seed sales as everyone else wants to get their garden up and ready too. Its not uncommon at this time of the year to be working outside for 8 – 9 hours straight – we rarely break for lunch. Farm work is very season and weather dependent, you cant put a task off until next week because you want a break it has to be done NOW or its too late. 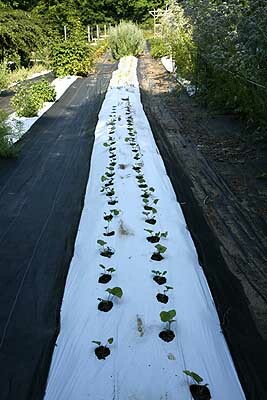 Little plants need a place to grow and crops need to be harvested at the peak of ripeness. This means that almost everything else in the world is put on hold. Farmers don’t get out much, they are either working or sleeping because they are exhausted from working. Other stuff in life suffers, friends, social life (what social life) and especially social media. I had intended to update this blog on a bi weekly basis and keep everyone informed about what we were doing, well that didn’t work out well. There was just not time to write the articles. I made a few notes but that was about all. Sorry everyone but that’s life on a farm. Hopefully I can get back on schedule now and maybe do better next year. Author Janice Hazeldine PhDPosted on June 11, 2016 June 20, 2016 Categories Farm work thru the yearTags farming, spring field workLeave a comment on The frantic spring push is finally over. When you have a farm. Why spend a whole bunch of money on a gym or fancy exercise machines? All you need is a small farm. OK there is not so much to do in the winter months but come spring its get out there and work, at least we are in the fresh air. With the beginning of spring comes the compost work. Every year we put more organic mushroom compost on our field rows. This year we are also redoing some of our perennial rows since its time they were changed around. This work in our ‘main field’ (named because it was the only field we had to start with) is easier than our side field (named because its on the side of the main field). We can take the tractor down the rows rather than having to barrow it in as is needed in the side field. However its still a lot of work and exercise. Drive the tractor to the compost pile, which is at the front of the property, the only place the tractor trailer has access to dump the load when they deliver it. Dig the compost pile out and fill up the cart behind the tractor. Drive the tractor to the row and slowly add the compost to the row. Do the whole thing again until the row is finished. Start on the next row. We tend to buy a load of compost about every two years. Why mushroom compost? Because its cheap. Here in New Jersey we are fairly close to the mushroom farms in Pennsylvania and they always have a lot of spent compost. Its fairly cheap to buy a whole truckload, actually it costs a little more to have the guys truck it over here than the compost itself costs. But it’s the cheapest good organic material we can get. When it first arrives its wonderful stuff, all light and fluffy and easy to shovel. Like shoveling soft ice cream. The downside is that its light and fluffy so you need more of it to do the job so you need to dig more cart loads of the stuff. After its settled which takes about 6 months it gets harder and more compacted. You actually need to put your foot on the shovel and dig it out. More like shoveling hard frozen ice cream. Its tough but the upside is you don’t need to shovel as many cart loads because its more compacted. Even so there are a LOT of cartloads need to be moved. This past Sunday we did 7 cartloads, I had already don’t 3 on my own last week. That did the two perennial rows in the main field. Why add it every year? Because we are on really poor sandy loam soil. When we moved in there was almost no organic material in the soil at all. It was terrible and had no soil structure at all. Now with the addition of compost to the rows every year its beginning to form a reasonable structure and retain more moisture. It’s a slow job but we are getting there. For most of the rows where we grow annuals we don’t need to add that much every year. For perennial rows they get a really heavy addition every time they get changed which can be anything from 4-8 years depending on the species. Anything that is being put into production also gets a hefty addition since its going to be in pretty poor shape otherwise. This year we are moving some perennials around and thus redoing some rows in the main field this has to be done early so we can get the plants moved before they grow too much. This weekend we prepped two rows. We have another two there to do. Then all the rows in the side field where we grow the annual plus the new extension we are adding this year. Today I am stiff and aching, wont get out there to work again until tomorrow. By the end of the month I should be back in shape and used to digging. Keeps you fit and its free. Adding compost to our main field from tractor cart. 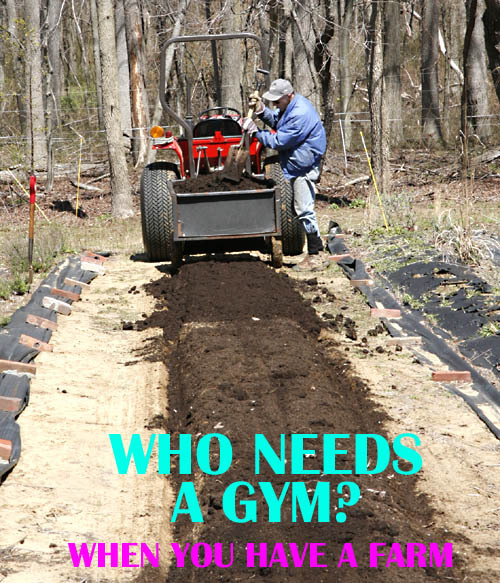 Author Janice Hazeldine PhDPosted on April 11, 2016 May 2, 2016 Categories Farm work thru the yearTags adding compost, compost to fields, farming, spring field workLeave a comment on Who needs a gym?